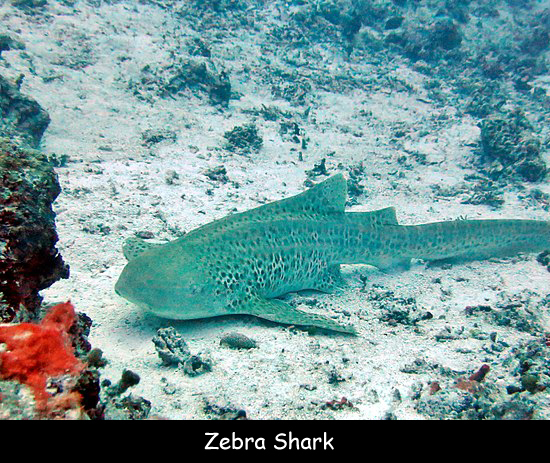 The Zebra Shark is found in the warmer coastal waters and around tropical coral reefs. It is most commonly found in the Indian and South Pacific oceans. The scientific name of this shark is Stegostoma fasciatum. These sharks have a flattened body with a long tail fin which allows them to be more agile in the water. They have a flexible body which allows them to squirm into narrow crevices and reef channels in search of food. As juveniles, they have dark bodies with yellowish stripes but the pattern changes to small dark spots on a grayish-tan background when they reach maturity. The diet of the Zebra Shark mainly consists of reef mollusks and crustaceans as well as small fish. Like other bottom dwellers, this shark species can also pump water over its gills. This shark belongs to the order Orecctolobiformes, family Stegastomatidae and genus Stegastoma fasciatum. The average lifespan of the Zebra Shark ranges from 25 to 33 years. They usually hunt during night. They rest quietly on the bottom. These sharks can breathe easily while resting on the sea floor, unlike other shark species. Females lay an average of ten large eggs. These eggs hatch after an incubation period of around 5 months. Adult individuals are non-aggressive towards human beings. This shark is commonly hunted for its meat, fins and liver oil. Its liver oil is used in making vitamins. Their mouth and teeth are designed for crushing through the exoskeletons and other shells of their prey. Declan, Tobin. " Zebra Shark Facts for Kids ." Easy Science for Kids, Apr 2019. Web. 21 Apr 2019. < https://easyscienceforkids.com/zebra-shark/ >.